Rebiya Kadeer, leader of the separatist World Uyghur Congress, has attempted to gain public sympathy for the Uygur ethnic group in Xinjiang -- using wrong news photos. Kadeer, whom police say is the mastermind of the deadliest riot to strike China in decades, displayed a news photo in an interview with the Al Jazeera news outlet Tuesday that she asserts was taken in Xinjiang. In actuality, the photo depicted a protest in Shishou, Hubei province, on June 26. The photo was first published on Nanfang Weekly's website the day of the incident. 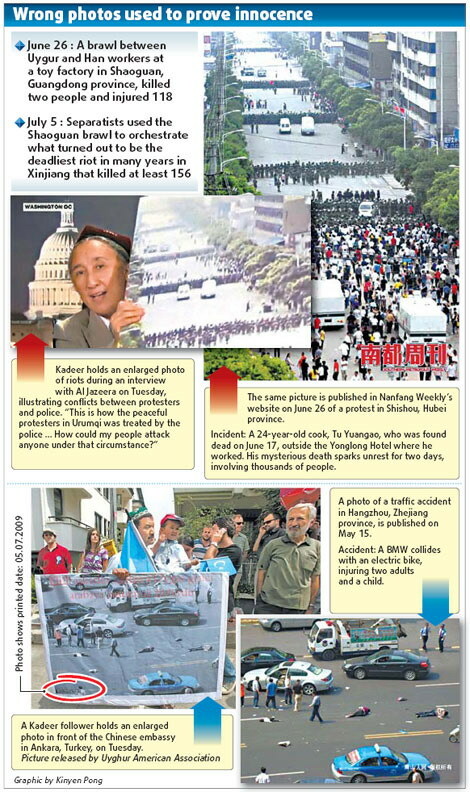 The Xinjiang riot occurred on July 5. Kadeer explained Tuesday that the World Uyghur Congress was not responsible for the recent violent clashes in the Uygur autonomous region, in which at least 156 people were killed and another more than 1,000 were injured. In the photo, police officers are lined up in seven rows on the street to stop a group of people from moving forward. "This is how the peaceful protesters in Urumqi were treated by the police," said an emotional Kadeer. "How could my people attack anyone under that circumstance?" One of Kadeer's followers used a similar tactic Tuesday as he was demonstrating in front of the Chinese Embassy in Ankara, Turkey. In a picture released by the Uyghur American Association, the demonstrator is seen holding a photo depicting the "victims of the violence of the riot in Urumqi". The photo, however, shows the scene of a traffic accident in Hangzhou, Zhejiang province, on May 15. "How stupid is Kadeer and her organization to make such mistakes?" said a netizen after news of the misleading photos spread over the Internet. Officials refuted Kadeer's claims that riots have been spreading across the region. "There were signs of unrests in Kashgar and Yarkand, northwest of the region, but we had the situation under control before they escalated," Chen Li, director of the information office of the Kashgar region, told China Daily Thursday. Information officials in Aksu, Khotan and Karamay said there were no sign of unrests after security had been tightened following Sunday's riots in the region's capital of Urumqi. On Wednesday, the Wall Street Journal published an article by Kadeer in response to the Urumqi violence. In the article, she writes: "The unrest is spreading. The cities of Kashgar, Yarkand, Aksu, Khotan and Karamay may have also seen unrest, though it's hard to tell, given China's State-run propaganda". Kadeer also alleges that police had killed more than 100 Uygurs while breaking up mass demonstrations in Kashgar. She said troops had entered Kashgar, with two Chinese soldiers posted to each Uygur house. In a written statement to Xinhua, the public security bureau of Kashgar denied the allegations. The bureau's statement said that more than 200 people gathered at the Id Kah Mosque, the largest mosque in China, and created a "disturbance" at approximately 5:15 pm on Monday. Local security forces and armed police rushed to the scene, "using vehicles mounted with loudspeakers to disperse the masses", the statement said. The authorities "reacted immediately to round up troublemakers and quell the incident", it said. Police said they also dispersed the crowd at about 6 pm with no deaths or injuries.